My love of papercrafting has been a consistent theme throughout and I’d always wanted to run my own craft business. So, when I saw Stampin’ Up! products in a craft magazine back in 2009, I had to find out more. That involved a trip to one of the big craft shows where I sought out the Stampin’ Up! stand and chatted to a lovely lady. During our chat, we discovered that we lived quite close to each other, had a shared love of theatre and also had a mutual friend – it’s a small world! After attending a couple of the lady’s classes and using some of the products, I was hooked, finally joining their Stampin’ Up! team in February 2010. I’m not sure what took me so long! I initially started running the business to treat myself to beautiful crafting products at a discount and then progressed to hosting parties and classes and growing my team. I had a significant Birthday ending in ‘0’ in 2013 so spent a lot of the year travelling and having fun. This meant that the business was neglected a bit, but I made sure I did just enough to meet my minimums to stay current. Then, in July 2015, my circumstances changed massively. I was made redundant from an organisation I’d been working at for almost 23 years. So, after taking the summer off and a lot of thinking, I decided that I was going to move my Stampin’ Up! business from a hobby to something much more and start up my classes again on regular basis. In June 2018 I finished my training to become a Nail Technician so am now also a mobile Nail Technician. This takes up my time when I’m not crafting. Papercrafting and Pampering – the perfect combination! When I’m not creating pretty things or making nails look pretty, I can normally be found in a theatre, either backstage, Stage Managing local amateur productions, or sitting in the auditorium watching lots of professional shows. I’m also a huge fan of music with my particular favourites being Bon Jovi and I like to attend their concerts when I can. I have been lucky enough to see them perform at their home stadium in New Jersey and have met Jon Bon Jovi several times – eek! 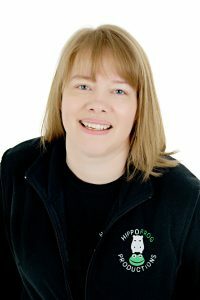 Well, my husband likes hippos and I like frogs, so, when we were looking for a name for our backstage activities, we chose HIPPOFROG and have HIPPOFROG Productions for our stagey things and HIPPOFROG Designs for my crafty things. It’s also the reason for the grey and green you’ll find scattered around the site!